THE STEAMY HUMID AUGUST WEATHER BRINGS OUT THE BEST IN MANY LATE SEASON ANNUALS LIKE THIS 'JOSEPH'S COAT' AMARANTH, AMARANTHUS TRICOLOR. RARELY SEEN IN GARDENS TODAY ( SEEMS LIKE I SAY THAT A LOT LATELY! ), IT'S INCREDIBLE TO THINK THAT THIS TALL ANNUAL GROWS FROM SEED THAT IS DUST-LIKE. The full moon of August marks a critical time in the summer garden, high summer has arrived. Just in case you haven't noticed that the song birds have now become silent not, and that the hot weather has relocated them deeper into the cool forests. They need time to rest and to build energy now that they have completed their first and often second broods for the season. 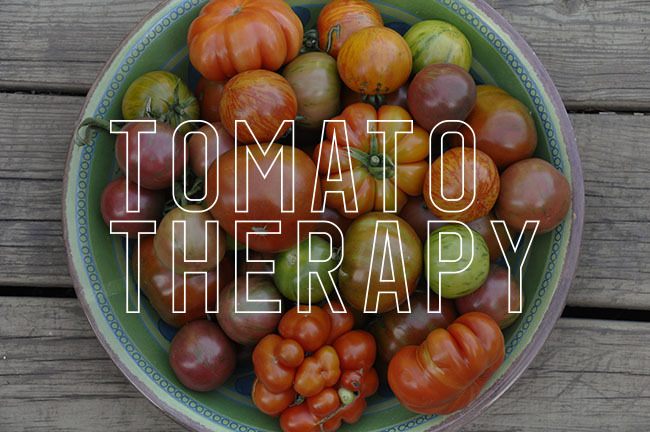 Crickets and the buzzing of insects have replaced them, during the day, wasps, yellow jackets and dragonflies glide over tall tomatoes and grasses, and at night, it's all crickets, all the time. SOMETIMES SOLD AS 'SUMMER POINTSETTIA', AMARANTHUS TRICOLOR WAS ONE AN ANNUAL GROWN AT MONTICELLO, ONE OF THOMAS JEFFERSON'S FAVORITES. HE LOVED IT SO MUCH, HE SHARED SEEDS IN A SHIPMENT TO HIS BROTHER-IN-LAW FRANCIS EPPES, FROM PARIS in 1786. THESE WILL LOOK THEIR FINEST IN A FEW WEEKS. 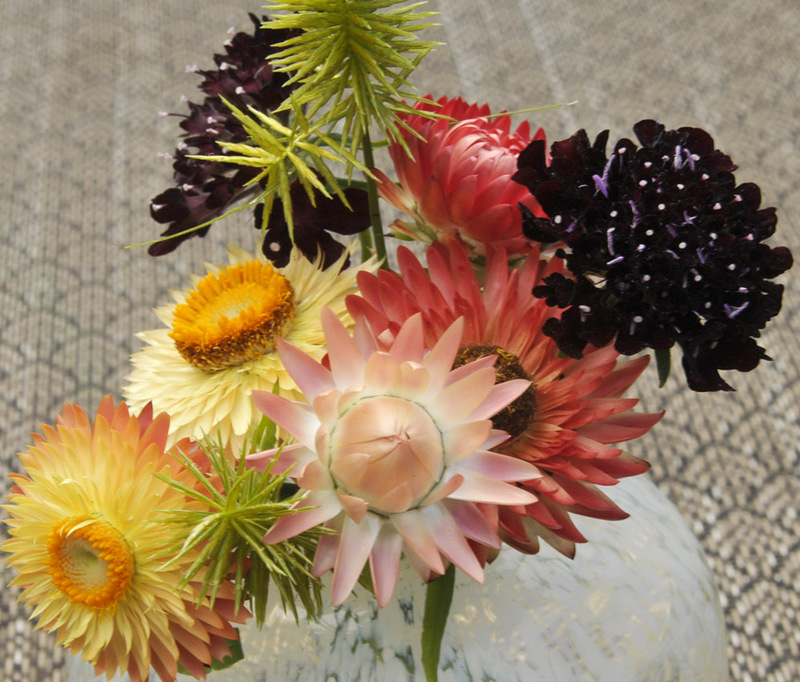 You may remember a post I made in April, when I planted the seed for these strawflowers, a popular blend of colors created by Johnny's Selected Seeds of Albion, Maine. It quickly sells out, usually by mid January, so one needs to order it early. I did, and, I planted the 24 seeds that arrived in the packet which all sprouted quickly in the greenhouse. All seemed fine until a mouse ate them all. Luckily, I tore open the packet and couple of seeds were stuck in the seam of the paper folds, ensuring at least three plants which have now bloomed. So basically, I got an apricot, a peach and a nectarine. I can only imagine what the entire mix palette looks like. Here, they are combined with the black Scabiosa. Next year, I will grow more, for I don't think that I've grown strawflowers since I was in my twenties, which was like five years ago, right? Or is it, Love Lies Green? Whatever, these 'Love Lies Bleeding ( the green form) have reached 7 feet tall in our intense tropical summer weather, and they finally are starting to drop their flower stems which make them so cool. 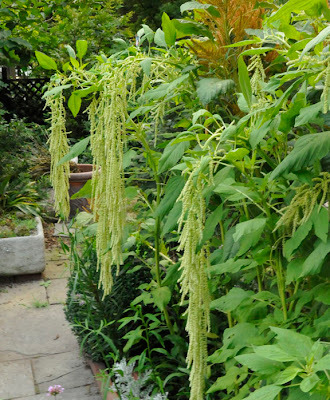 These stylish green tassels belong to a family of plants related to Celosia called Amaranthus, specifically, Amaranthus caudatus. 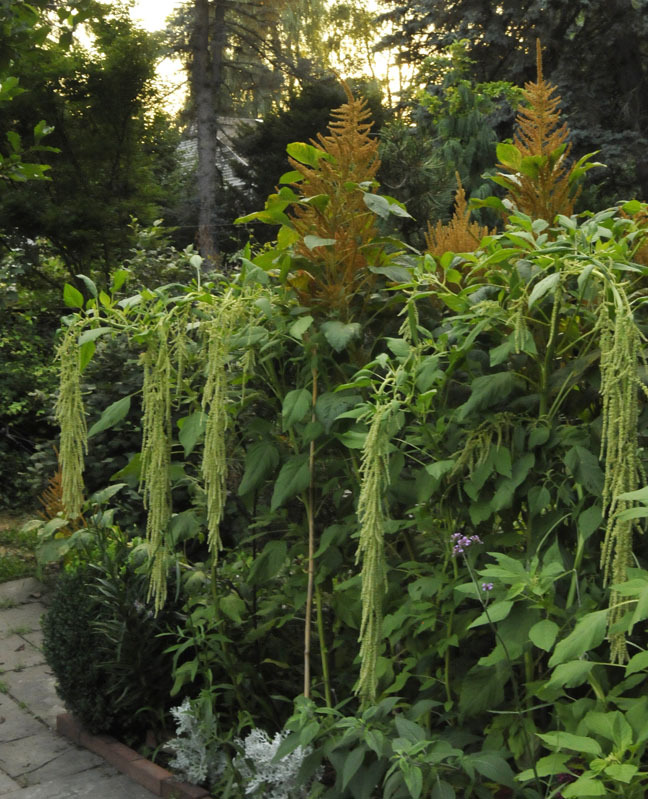 Growing 'Emerald Tassels' isn't easy, for simply buying a six pack at a garden center will rarely reward you with plants like these 7 foot tall giants. But they are easy enough, as long as you follow two rules. One, Plant the seeds yourself, either in your own plastic pots, or better yet, in the ground where they are to be grown. 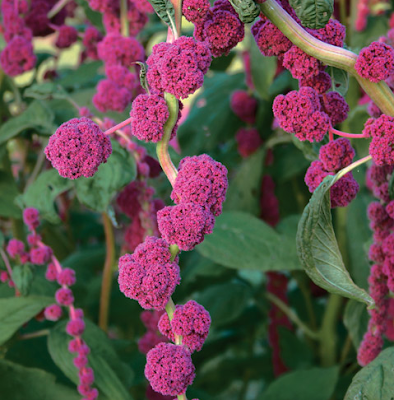 If started in pots indoors ( as these were), carefully remove them when large to their final growing location, for Amaranthus ( and Celosia) detest transplanting, and if they ever experience stress while in a pot ( be it becoming even ever so slightly root bound, or allowed to dry out even once) they will virtually stop growing. I really don't know what I did right this time, but I think it might have more to do with the second rule to growing beautiful Amaranthus, and that is to provide a hot, humid summer ( thanks, no problem), and, a constant supply of moisture and rich soil ( which this bed in front of the greenhouse can't help but provide for some reason). There isn't much that I don't grow, but I always make room for annual flowers. I suppose it's partly because they are some of the first plants my mother let me grow, for I remember sowing seeds at a very young age, and learning quite early, well before I was 10 or 11, what a Cosmos seed looked like vs. a Zinnia. Dad would dig compost from the large compost pile out back, and I imagine that the soil was rich with all of the chicken manure from our hens. The whole process would start in late February, and by mid March our glassed in front porch was full of these large wooden flats, about 4 inches deep and about 30 inches square, I think my father brought them home from the Newspaper, where he worked the night shift as an illustrator. 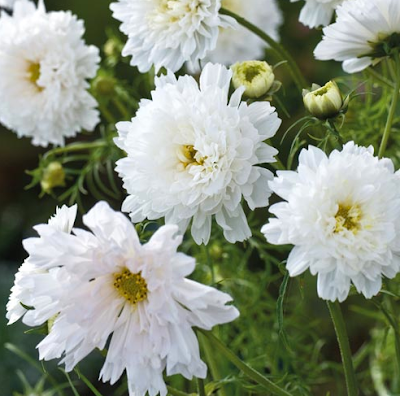 Annuals can be stylish, and this is the time of year to curate your collection so that you can start your own, and not be at the mercy of your garden center. 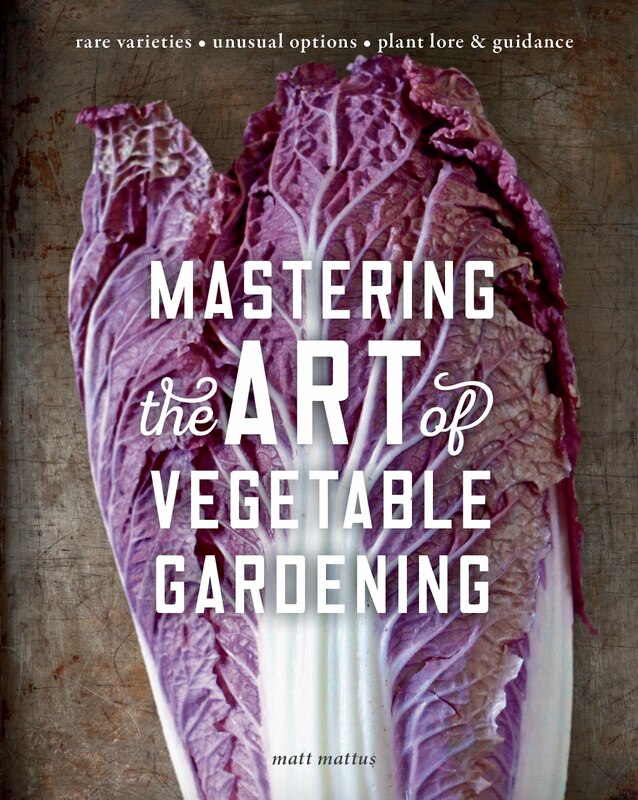 We never sterilized soil, or fussed with much or anything other than carefully planting seeds into tiny rows. No bottom heat, for the sun would heat the porch to nearly 70 degrees during the day, and at night, temps would drop to about 40. Still, mom had flower bed everwhere, and I can remember the entire scheme, for at that age, the zinnia and scabiosa were taller than I am. I think that's one reason why I love the scent of snapdragons and marigolds, they were at nose height. Apparently, moms flowers were well known in the neighborhood, and she would pick and make arrangements all summer long, clearly, I got my love for plants partly from her. But annuals hold a dear place in my heart even today, and each year, although I limit myself to what I will gro. Beyond the Proven Winner's series, which I admit, really preform well, I do cycle through the classics every few years. A certain bed along the walk of the greenhouse may hold a few dozen Scabiosa one year, and another, miniature Zinnias, or China Asters, such as last year. Mom always grew tall Asters, and I remember their unique blend of violet, lavender and pink. This year, I think I may plant Four O-Clocks here, not sure yet. But I know that I will grow Marigolds, for I skipped them last year, and I missed their scent too, which particularly reminds me of the first frost of autumn, when mom would pick most every flower in the garden to save them from the frost. 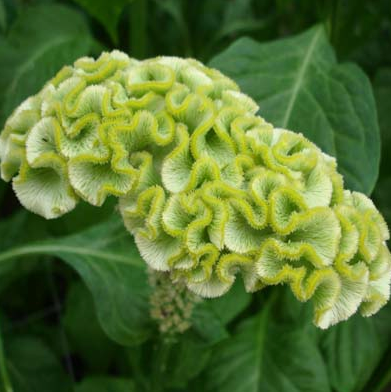 Celosia Spring Green, a new crested green form. Some new varieties this year I want to try are the many double Cosmos bipinatus, which are available from a few sources, but I will order mine from Johnnys Select seeds. 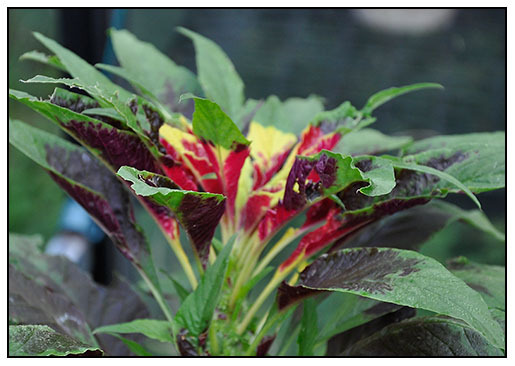 Then, at Harris Seeds, there is a beautiful green Celosia called Celosia Spring Green, which will add interest in arrangements since there is nothing like apple green, magenta and orange. 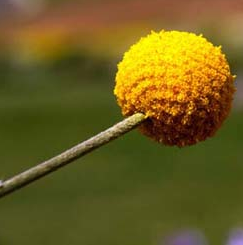 Gold colored Craespedia is one of the most stylish flowers on the wedding trend sites. The gold mixes well with magenta's, violets and silver foliage, and is very stylish indeed. Instead of showing the new annual introductions, I am sharing what I am growing. 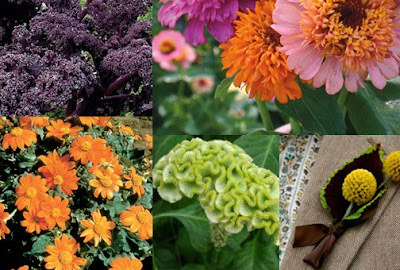 If you want to see some really stunning-but-not-for-me varieties like Zinnia Zahara Rose, go check out the other blogs. It's nice, but it just won't fit into my schemes. But Sweet peas always do, and after seeing the Sweet Peas in England last year, and at the Chelsea Flower Show, I am addicted again, as I was as a kid. 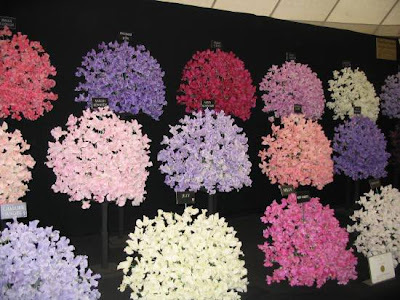 I think I will limit myself to all of the violet and periwinkle shades, for together, they make ones heart skip. Check out these are a fine English blog. 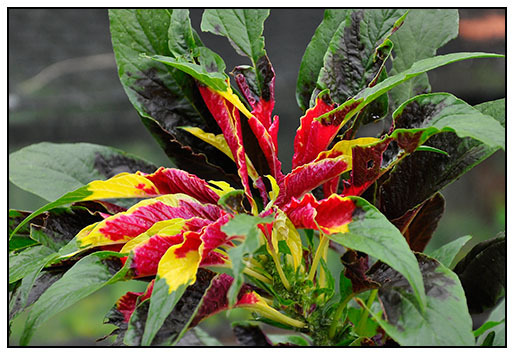 Park Seed Company has an interesting Amaranthus, called,'Dreadlocks'. I am thinking about growing it, since it is 3 feet tall, and that appeals to me. They also have a Zinnia called Candy Mix, which is pretty, if you can choose the odder color combinations. 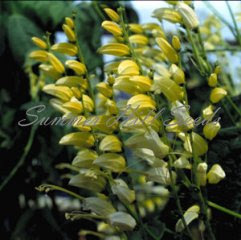 The vine related to Morning glory, Mina lobata comes in a sweet yellow form, available at Summer Hill Seeds. I grew the orange to red form one year, and it was in full bud when I accidentally tore the stems from the roots while moving a large urn in front of the greenhouse, so I may try this one this year. 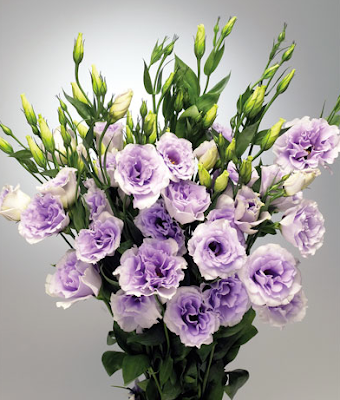 The Lisianthus plants from Burpee are always worth the money they cost, for I can't think of any other annual that has the long lasting quality as a cut flower, and the color palette, which rivals the Spencer varieties of English Sweet Peas. One hot humid evening last July, Joe and I went to eat at a local seafood restaurant in the city. Planted around the parking lot in a strip of soil between the hot concrete and the sidewalk was planted Tithonia, the "Mexican Sun Flower". They were so beautiful, and bright persimmon in color with healthy thick green stems and broad floppy leaves, I noted to myself that I should grow some this year, so they are on my list. 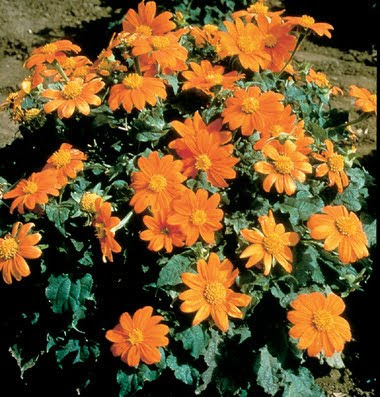 A dwarf variety is available from Johnny's. Tithonia, Fiesta del Sol, which I will grow with Redbor Kale, a purple kale that will make the Purple leaved Sweetpotato vines and omnipresent black Coleus everyone else will grow, green with envy. 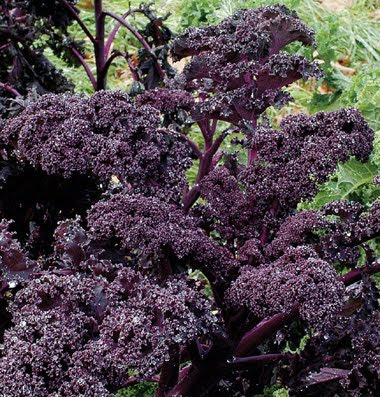 Redbor purple Kale, a refreshing option to all of the other purple leaved plants, and you can eat it.